In November 2016, I wrote to the chief executive of every NHS trust in England, calling for their personal commitment to work with PHE towards a truly tobacco-free NHS. 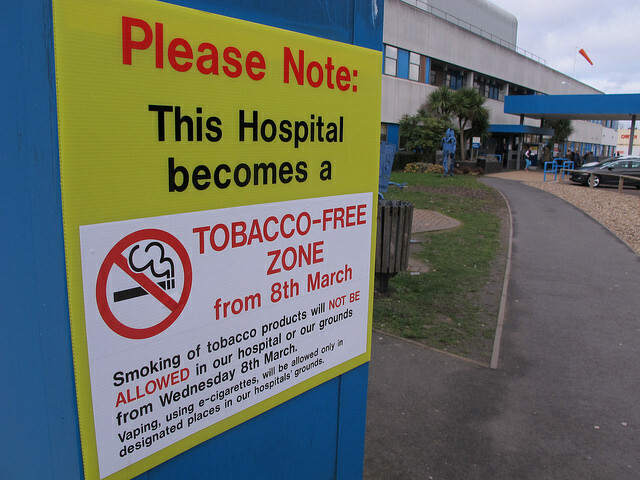 We're delighted that Colchester Hospital University NHS Foundation Trust and Ipswich Hospital NHS Trust have risen to the challenge and, together with providing quitting advice and support for smokers, introduced completely tobacco-free estates on Wednesday 8 March. Colchester General Hospital and Ipswich Hospital are based in two of the largest towns in East Anglia, making them the main port of call for thousands of people, both as a workplace and for treatment. The decision to take the final step and go tobacco-free has not been taken lightly but with joint chief executive, Nick Hulme keen to improve the health of his staff, patients and anyone who visits the sites, this was an important step forward in combating the detrimental effect of smoking on the population, community and the NHS. Focusing on staff and patient support has been the way forward for these hospital trusts and their mission to become tobacco-free. Patients who smoke are asked if they would like help to stop and are referred for further support wherever appropriate. ASH estimates that in Colchester smoking costs£49.5m a year with a cost to the NHS in the area at £6.2m. In Ipswich, the figures come in at £44.5m cost and £6.1m across the NHS. By putting a policy in place across the trusts that deters smoking and provides quitting support to patients, staff and visitors, it not only benefits the local area and its services but most importantly the health of the community. As well as responding to PHE’s request for a tobacco-free NHS, the trusts recognised that they have a responsibility as a healthcare provider to encourage healthy lifestyles in addition to listening and acting on complaints from patients and visitors about their exposure to second-hand smoke and the litter caused by cigarette butts. Advance preparation and clear and continuous communication have been essential to getting the hospital sites, patients and staff ready for the change. A small working group was set up to act as the conduit between management and staff, patients, GPs and other hospital users. Its members shared with management any concerns about how the policy will be enforced and made practical suggestions to make it work for everyone. Staff are expected to lead by example in making their tobacco-free trust a success. A staff guide has been produced for those who may feel uncomfortable about challenging someone who is smoking on site, guiding them to steer smokers to the stop smoking services in Essex and Suffolk. “We know that within just 72 hours of stopping, your breathing becomes easier as your body becomes clear of nicotine and the mucus in your lungs starts to clear. Your sense of taste will return and, after three months, coughs, wheezing and breathing problems improve as lung function increases. After one year, the risk of heart disease is about half compared with a person who is still smoking. Both hospitals had the plans for going tobacco-free on the home page of their website and there are now webpages explaining the policies and the reasons that these changes matter so much. 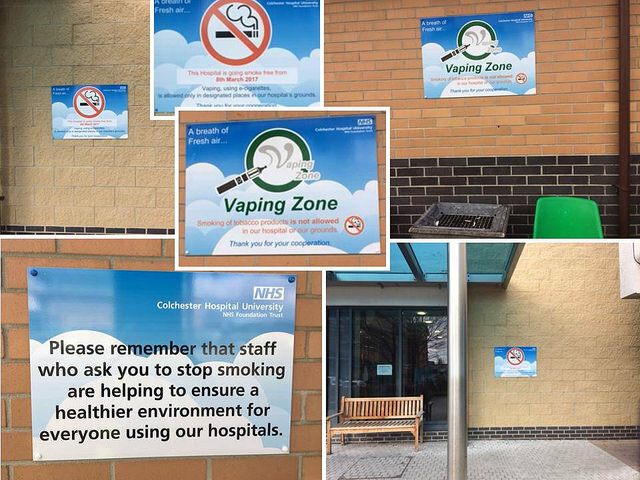 The hospitals have removed smoking shelters and replaced them with designated outdoor vaping points. New signage has been installed across the sites, particularly in areas where smokers used to gather. Doctors and nurses at the hospitals gave patients, the public and staff plenty of notice of the change in the hope that it would encourage more people to take the first steps towards quitting with support from local stop smoking services. Discussion groups were held with staff and patients to find out what support they need to help them give up smoking and to tackle the challenges they might face doing this as an employee or patient within a tobacco-free environment. Nothing changes overnight and the team are aware that a shift in the culture around smoking in hospital grounds will take time to settle in the minds of smokers. This will be achieved only if the right support services are in place for people who wish to give up smoking and everybody commits to tobacco-free becoming a reality. Be sensitive – recognise the unique circumstances and challenges faced by staff, patients and visitors in an acute health setting and consider setting up a small working group to resolve any sensitive issues. Plenty of notice – the more time you give people to digest the facts and the rationale for the change, the less of a surprise it will be when they are asked to stub out their cigarettes! Do you want to know more about our Tobacco Free NHS campaign? Check the hashtag #TobaccoFreeNHS.